There is a good place in Waigeo island that is very suitable for snorkeling and birdwatching. Its name is Paradisea Beach. It is located in southern region of Waigeo. I enjoyed birdwatching and snorkeling in the area several weeks ago. The best time to do birdwatching is in the mornings and in the afternoons. Birds such as Coconut Lorikeet, Eclectus Parrot, Sulphur Crested Cockatoo, Palm Cockatoo, Blyth's hornbill, Rufous-bellied Kookaburra, Beach Kingfisher, and Red Bird of Paradise. 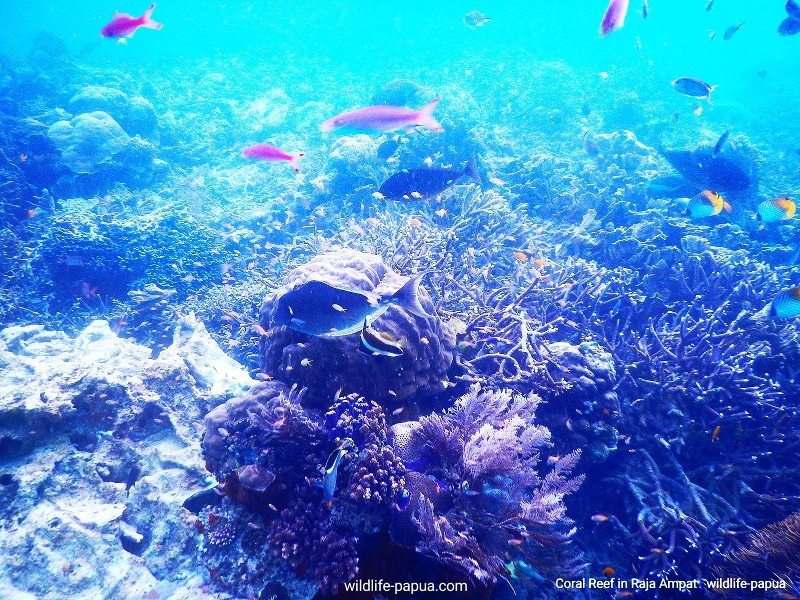 The coral reef at Paradisea beach is a very rich marine environment. It is the natural habitat of a lot of species of marine animals. Table corals, Elkhorn Corals, and sea grass thrive at the depths from 0.5 to 10 meters. To watch those birds I used a pair of Visionking 10x42 mm binoculars that are equipped with Bak4 roof prisms. They are quite sharp when I use them to watch birds in tall and distant trees. I also brought my spotting scope. It was a 20-60x60 Kinglux. To take pictures of the birds, I used my old Fujifilm HS50EXR. They were not the best birdwatching gear on the market but they were powerful enough to enhance my birding experience at the Paradisea beach. After two days of birding in the area, I completed my activities at the beach by enjoying snorkeling over its coral reef. I saw a lot of species of fish including parrotfish, surgeonfish, grouper, boxfish, butterflyfish, moorish idol, needlefish, barracuda, and various damselfish. Raja Ampat has been famous around the world as a regency that has got the highest marine bio-diversity in the world. A friend of mine who owns the land plans to build a dive resorts at this beach. Soon, there will be bungalows which can be rent by tourists who want to enjoy snorkeling and birdwatching at this beach. As a matter of fact, Raja Ampat has got hundreds of islands which visitors can choose to enjoy snorkeling, and birdwatching such as Mansuar, Mansuar Kecil, Gam, Arborek, Waigeo, Piaynemo, Batanta, Salawati, Misool, and Wayag. There are homestays or dive resorts operated by local people and foreign companies. 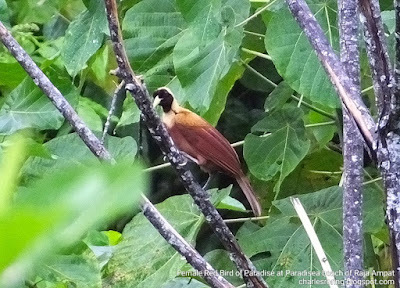 If you are interested in taking snorkeling and birdwatching tour in Raja Ampat and mainland West Papua, please, contact me (Charles Roring) by email to: peace4wp@gmail.com or send text message to my whatsapp: +6281332245180.